Ensuring continuous business processes entails effective, flowing and efficient internal communications. As a business owner, you need to understand its importance and take steps to maximize its effectiveness. One of the important requirements to achieving business success is getting everyone on the same page. Unless everyone in your organization sees eye to eye, you will not be able to drive efficiency, productivity, service and profits up. Therefore it is of utmost importance to improve your internal communications. Communication within the organization aims to bring all employees and teams in the organization together. This involves transparency and a willingness from both the management and the staff to bring their own perspective into running of the business. The production team is focused mainly on the quality and quantity of products manufactured; the sales department’s focus is on the amount of units sold, while the marketing personnel aim to showcase the product’s good points to customers. Each of these departments hold information about their specific goals and processes. While all these information are all vital to the success and continuous operation of the organization, they will amount to nothing if not shared between and among the different teams. Most management teams understand the need for internal communications, but they fail to understand how to make the communication between departments effective. As a result, they send email upon email and call numerous meetings, thinking that these methods will encourage communication. While these methods work to some extent, the reality is that most emails tend to be ignored. Sure, employees would spend a few minutes reading an email, only to forget about it as soon as they are finished reading. Meetings are also met with the same attitude, with almost half of employees regarding meetings as a waste of time; if they had a choice, they would rather do something productive on their desks than attend an hour-long meeting. To foster effective internal communications, businesses must evaluate their communication methods to weigh which ones work and which do not. Probably the biggest complaint of employees is their lack of knowledge and understanding of business plans and goals, even if the management tries its best to communicate these with them. In a similar manner, employees have a difficult time trying to communicate their concerns with the management. To understand employee insight better, management must actively seek employee feedback through various surveys. Because the staff are the ones actively dealing with customers and actually working on the processes, the management can glean valuable information about the nitty-gritty of the operations. But surveys can only do so much. Unless the management actually does something as a result of the feedback from employees, employee feedback surveys will just be like email messages and meetings: a complete waste of time. Inaction from the part of the management will cause frustration in the employees, making them feel that they are not being listened to. As a result, they would be less likely to listen to management. Aside from holding surveys and using survey results to improve operations, business leaders would do well to provide opportunities for employees to immerse themselves in other departments, so they could get a feel of how the department functions. Through shared experience, employees will have better interdepartmental communications which can and will eventually lead to trust, cooperation, increased efficiencies and better customer service. Communication Tools: Bane or Boon? Effective communication is a skill that everyone should possess. However, the rise of technological solutions and tools can sometimes add to communication issues brought about by the conflicting personality types of the communicators, and the overwhelming amount of information they have to communicate. More often than not, employees spend a considerable amount of time just on clarifying information communicated to them. But not all tools muddle up the information. There are technological solutions like DeskAlerts that improve upon existing communication systems in businesses. 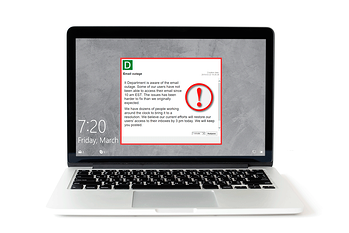 DeskAlerts allows administrators to send important messages to various channels, making sure that the information is not only received but also acknowledged by the intended recipients. DeskAlerts has a fully customizable feature that allows you to send information tailored to your target audience through multiple formats like documents, video, graphics and even flash presentations. With these features and more, DeskAlerts will surely help you improve how your organization communicates. Effective internal communications help businesses achieve their goals by increasing understanding and cooperation between and among departments. By providing your employees the information they need to accomplish their tasks, you empower, motivate and engage them at work, thereby increasing efficiency and productivity. Do not fall victim to poor communication within your organization. Lessen the emails and meetings; instead, focus on the information you want and need to share with the rest of your workforce. Use DeskAlerts to deliver timely communication to improve your company performance and lay a strong foundation for a rich communication culture for the future.